I remember when we arrived in San Francisco last year, more than a few people mentioned to us the strange mix between wealth and poverty here in one of the biggest cities in the world. San Francisco is the home to some of the wealthiest people and companies on the planet, and it is also one of the most expensive places to live. But it is also ‘home’ to hundreds, perhaps thousands, of homeless people. One such homeless person is Jasper. Jasper is an African American homeless man that sits outside my local Walgreens, and he is an absolute gentleman. What I like about Jasper is exactly what I like about most people – he has a positive attitude, he’s nice to people, and generally he is inoffensive. That might sound like a strange list, but in context of the documentary ‘Streets of Paradise’, it makes more sense. In the documentary, a number of people in Santa Barbara were interviewed for their opinions and thoughts on the homeless people living in the city. I recall one man said that he doesn’t like standing near homeless people that smell – he finds it offensive, and would prefer it if people that smelled weren’t near him, his home and his shopping centers. Now, I can understand that initial feeling or reaction to a bad smell – but for me, the understanding that many people can’t change the way they smell quickly counteracts that initial reaction. If I was living on the streets, I doubt that my body odor would be the first thing on my mind each day. So while someone smelling less than favorable is, well, less than favorable, it’s not a big deal to me. Another man in Santa Barbara said he was annoyed when people begged for money. Money is a funny thing, though. People can ask me for my time, my thoughts, and my company… but the moment someone asks for my money, I’m defensive. I’m not really sure why. I have been asked for money by homeless people hundreds of times – sometimes I’ve given it, other times I haven’t, and only once did I offer to get them some food instead. On this occasion, the man replied ‘I don’t want the food, I need the money for weed’ – so I have never offered food again. I understand that he was perhaps an anomaly, but I wouldn’t give my best friend money for drugs, so I won’t give money to a homeless person for drugs. So I can see the man’s point. But I can also see why homeless people have to try it. If you don’t have something, and someone else has what you need, you should ask. And if you ask enough people, without any success, you will inevitably end up feeling tired, defeated, and desperate. But, homeless people have to keep trying, so I can’t blame them for that. After watching the documentary, I spoke to my husband about it, to better understand both my opinions on homelessness and to see how they compared to someone else’s. The more I think about it, the more guilty I feel for having so much, even though I genuinely try not to take anything for granted. I have a roof over my head, plenty of food in the fridge, and a support network of friends and family around me. I wish that everyone in the world could have that. I don’t know if money is the answer to homelessness, but I think compassion is a step in the right direction. Recently I watched Forks Over Knives (2011), a documentary that ‘examines the profound claim that most, if not all, of the degenerative diseases that afflict us can be controlled, or even reversed, by rejecting our present menu of animal-based and processed foods.’ (IMDB) Despite having heard of numerous pro-whole-foods-plant-based-themed documentaries, this was the first that I watched in it’s entirety. And it was good. But, for a number of reasons, I am still not convinced it’s the healthy lifestyle choice for me. I can begin my argument with a rebuttal. A huge rebuttal, in fact, that on paper, trounces my argument easily. The rebuttal is that I believe the information given in the documentary is 100% true. I have always believed, known even, that many of the degenerative diseases we humans are ‘prone’ to can be prevented, and sometimes reversed, by healthy lifestyle. To me, healthy lifestyle is defined as eating well, exercising well, and managing your life to avoid unhealthy stressors. So based on this, my pre-existing belief, I can easily take the next step to see that a whole-foods, plant-based diet is an example of ‘better lifestyle’. That is my rebuttal. But the sum of my argument is not logical. I will lay it out now, with full ownership on my part, and full warning to you, that many of the following points could be considered invalid, straight away, for being stubborn, emotional, or plain illogical. Here is why I am not convinced that a whole-foods, plant-based diet is the right choice for me. 1) I love meat. I truly do. Many different types of meat. Chicken is perhaps my go-to, my versatile favorite, but anyone that knows me knows that I absolutely love my steaks, too. And I have always loved meat. My family still share stories of my carnivorous ways as a youth; when I was really young, maybe only 5 or 6, I asked a waitress for a T-Bone the size of my plate, with no room for any sides. I still love steaks, but now try to eat much smaller serves, usually only 3-4 oz. But I genuinely love every bite. 2) Certain meats make me feel stronger. In particular, from time to time I feel weak, lethargic and tired, and almost always I realize that I’m also craving red meat. I feel like it is an in-built iron detector, and without fail, a night or two of red meat makes me feel better again. 3) I know meat. As in, I know how to cook it, many different ways, for breakfast, lunch or dinner. That doesn’t mean I have meat at every meal… but I know how to prepare it for any occasion, and how to prepare it well. So the idea of giving up meat gives me a culinary headache, because I wouldn’t know where to start. 4) I know the documentary isn’t just about meat – it’s about abstaining from animal based products in general. So let’s see – cheese, milk, yoghurt, cream and eggs, to begin with. I love all of these. I don’t love them as much as I love meat, but they are still a part of my day to day diet. An egg on whole grain toast with spinach makes me feel alert and energized for the day. A yoghurt-based fruit smoothie gives me a good lift after a gym workout. And cheese… well… what’s a grilled cheese sandwich without the cheese? Enough about the food aspect… let’s consider the physiological argument. 5) The documentary argues that many degenerative conditions can be prevented or reversed with the removal of animal products from the diet. As an anatomy and biology nerd, and an ex-member of the health and medical industry, this argument has many different facets. Yes, many degenerative diseases can be reversed – this is true. However, many people find they can reverse conditions such as high blood pressure and high cholesterol while still eating some animal-based products. I have seen this myself, heard about it continuously, and had it advised to me personally by countless medical professionals. But that’s the reversal – I prefer the idea of prevention. Take osteoporosis, for example. Defined by a weakened density of bone mass, which increases the potential of fracture, osteoporosis can be prevented or slowed quite easily. But unfortunately, you need to plan some 20-30 years in advance. The peak time to build bone mass is 25-35 in women, and a slightly older bracket in men. And diet is only a third of the argument; weight bearing exercise and genetics make up the whole picture. So while the calcium from milk and cheese might be better found from plant-based foods, a diet change of that style won’t be enough to reverse bone damage that began 30 years ago. I could go on further, but what I mean to say is that there is some doubt in my mind that a change in diet to reflect the whole-foods, plant-based idea is not the sole solution to degenerative disease. I have already admitted that much of my argument might be flawed due to lack of logic, or emotion. I can recognize that in many ways I am being stubborn; I see it, and admit it. But my love for meat, my experience in the health and medical industries, and the advice I have always been given, lead to remain unconvinced. But the documentary penetrated even my strong carnivorous defences – it makes me consider a change in diet. My sister would support it – she is already vegetarian, for primarily ethical reasons. My devouring of meat during family celebrations gives her both concern and comic relief. I know the little lambs, baby chickens and calves that I love so much would thank me for it. Stubbornly, I still have an illogical divider in my brain that disconnects the anatomical logic of the ‘leg of lamb’ cooking in an oven and a baby sheep running around a paddock. Like I said – illogical. But despite my stubborn, illogical and emotional argument, the DVD nonetheless has given me food for thought. Maybe, just maybe, I will reduce the intake of animal-based foods in my diet, and the world will not end. I knew nothing about who Cesar Chavez was, or what he was about, until today. With each of these reflections, I’ve known at least something about the subject before I researched them. But with Chavez, I knew only that there was a street named after him in San Francisco, that my bus goes past every day as I make my way to college. The source text I chose is the United Farm Worker’s website, which is the group Chavez founded in 1962. The site provides a background on Chavez, from where he was born and brought up, to where how he was educated, to how he spent his later years. Chavez was born in Arizona and from very early on, he understood injustice. His family had their home taken from them, when deeds were broken by dishonest white land owners. The Chavez’s had no options, but to take a loan that inevitably they were unable to pay interest on, and the house was lost. This began the cycle of debt for Chavez and his family. Recognizing this cycle, Chavez worked towards getting himself and his family out of it. Education, he thought, would be the key. But being in school during the 1930’s and 40’s meant racism was rife – you either suffered through it in the integrated schools, or chose a segregated school. Chavez and his brother ended up at thirty-seven different schools before Cesar left school in eighth grade, in 1942. Despite this early graduation, Chavez pursued his belief in and love of education, collecting and reading an amazing array of book throughout his life. In 1948, Cesar Chavez married Helen Fabela and together they moved to Delano to start a family. The time that Chavez spent with ministers, priests and in missions led him to pursue a life seeking justice for his family, friends and co-workers, through nonviolent measures. In 1962, the United Farm Worker’s group was formed to protect the rights of farm worker’s in California. Through Chavez’s leadership, the group helped lift the lives of thousands of worker’s across the state, ensuring better pay, better work conditions, and protection from racial and economic injustice. What really stands out to me about Chavez was the success he had with non-violent measures. He pursued his beliefs and the UFW’s interests without aggression, choosing picketing, protests and strikes over more forceful options. Chavez also went on a lot of fasts, often as a protest to the unsafe use of pesticides on farms, which put the health of worker’s and their families at risk. While I have always agreed with the non-violent approach, in any situation, the idea of fasting has me confused. In Chavez’s case, and in many other cases, I understand it is about awareness. And if it wasn’t for the attention given to Chavez’s public fast in 1988, where actors, entertainers, politicians and celebrities fasted with Chavez, perhaps the issues for farm worker’s wouldn’t have been addressed. But it has always seemed too passive to me. I think about the 40 Hour Famine that my primary school used to run once a year, for those that wished to take part, to raise money and awareness for World Vision. In this instance, the money gave this initiative a tangible result – at the time, just $1 a day raised or donated could feed an entire family in Africa, World Vision said. The program, from my understanding, has now switched from abstinence from food to abstinence from something – because fasting may not be so ideal in children and teenagers. It also makes me think about the breast cancer awareness campaigns that filter through Facebook each year. The first one I remember was with people updating their status to share what color underwear they wore. When people started asking why so many people were on Facebook declaring ‘Red!’, ‘White!’ or ‘Black!’, it was revealed as a campaign to increase awareness of breast cancer. How, exactly? No one could answer it. Their latest campaign involved changing your profile photo to a pink one, again for breast cancer awareness. True, the symbol of breast cancer awareness is a pink ribbon, and thus seeing this color pink might remind people of the ribbon they’ve seen elsewhere – but what does changing a profile photo actually do for the number of regular check ups, and the push for early detection? I don’t think it does very much at all. Irrespective of my thoughts on fasting as a form of activism or protest, Chavez’s fasting produced results. Through his non-violent actions, perseverance and willingness to stand up for himself and others, he was and still is the face of civil rights activism for many Mexican Americans. It has been a good few months since I’ve posted on here, but not by choice. There has been a lot to write about, and lots of photos taken – but no time to put them all together on this blog. But in one of my classes at college – that’s right, I’m at college, but more on that later! – a recent video has inspired me to get back to writing, here on my website, for all to read. Last week, we watched a documentary called When Hate Happens Here, about community reactions to hate crimes in Northern California. The video was impactful, to say the very least. But I won’t just say the very least. I will elaborate. The video reported on five specific hate crimes in California – the brutal bashing and murder of a young transgender teen, the shooting of a loving gay couple, the burning of three synagogues, the destruction of library books related to the LGBT movement, and the burning of a cross outside the home of an African American family. In some cases, the culprits were captured and charged. Other times, justice might not have quite hit the mark – in the case of Gwen, the transgender teenager, two of the defendants were charged with second degree murder, and the other two pleaded to voluntary manslaughter, but none of the charges were given the hate crime enhancement. What the cases all had in common was the hope, togetherness and perseverance shown by communities in the face of such tragedies. Schools, workplaces, and towns united to speak out against the hate crimes, to refuse to let them happen again, and to support the families and groups affected by such violence and hostility. But, why should it come down to the unity and togetherness of a community, after the fact? Why did the crimes happen in the first place? Hate crimes happen when a person or group targets a victim, based on the victims inclusion in a demographic or group. It could be a religious group, it could be the victim’s sexual orientation, their class, their skin colour, or even their political persuasion. If the perpetrator’s motivation was related to any of these areas, it could be considered a hate crime. But what in that perpertrator’s life led him or her to think it was ok to target another human being in such a way? How can they be so unaccepting, so intolerant, so violent? How can they possibly believe that it’s ok to inflict injuries upon someone else, purely because they think differently, feel differently, or believe differently? How dare they? Who or what are the influences in someone’s life that lead them to these actions? At one point in the documentary, a commentator said that it wasn’t just about tolerance of different people, cultures and ideas – but it was about acceptance. Shouldn’t acceptance be considered the norm? Isn’t it is common sense, not to treat people with such hatred, such disrespect, such agression? To me, everyone should be accepted, no matter who they are, where they are, or what they believe in. If someone believes differently to you, or prefers men while you prefer women, or believes there is five gods, rather than one, or none – respect their choice, their belief, their thoughts. You don’t have to change yours, because of theirs. There is no rule book in life that says ‘everyone must think and feel the same’ – we should respect and appreciate the differences and uniqueness in societies here, and around the world. That brings me to my travels and experiences. I have met a lot of people in the past few years. They were all amazing, in their own way, and many of them I will know for life. Some are gay, some are straight. Some have dark skin, others have light skin. Some believe in one god, some believe in none. Some speak with a strong accent, or speak very little english, while others sound just like me. Some are married, some are single, and now some are in civil unions. But these differences are beautiful. I don’t want a world where everyone thinks the same, where men can only love and marry women, or vice versa, or where we are all forced to believe in one god, one religion, one way of thinking. I want diversity, and unity. And while it may be too late for certain people in past or present generations to un-learn whatever it is that makes them believe their colour, gender, orientation or beliefs make them superior, I can only hope that in future generations, hate crimes don’t exist. So much has happened since I last posted on this blog. As I write this, the last entry is from mid July in Peru – and it is now October and we’re in Australia, celebrating our Engagement! That’s right – I’m making an honest man out of Jamie Talbot We are back in Australia for just a few short weeks before we head back to San Francisco, where we spent a wonderful month in September getting to know the city. While there, Jamie was so incredibly successful with his job interviews, and has accepted an amazing position with a company there. We can’t wait to head back to the USA to start the next part of our lives together, but before all that, there was enough time in Brisbane to catch up with friends and family for a fun celebration. A friend of mine was around to take photos for the evening, so all credit for these photos goes to Luke Brown – thanks, Luke! It was a fantastic night, and one with some awesome memories. Thanks to all our beautiful friends that could make it – we’ll see you again soon! I love Santiago. There, I’ve said it. The city, the people, the surroundings are all beautiful. The mix of foods, the options for sight seeing and the freezing cold air – I love it all. And this is after only one day! Knowing we have only two full days in Santiago itself, with the rest of the time being spent in Valparaiso and Easter Island, we made the most of it with an early start on Saturday. Franco from Free Tours Santiago met us in the Plaza de Armes for a four hour walking tour of the city. The sky was blue, it was a crisp 5 degrees, and it was one of the very rare days that the mountains were visible. Not just any mountains – the Andes, surrounding the entire city. Together with about 10 others, Monkey and I got shown Santiago by the experts, and Franco was excellent. I could recite the entire tour here, and take up a few hours, but to be honest I probably missed a lot of the details about the history of Santiago. Check with Monkey’s post though, because he has a better memory for these things. As for me – I was distracted, as usual, by the colours and lines and sights to see. Beautiful streets lined with trees of golden brown leaves, old buildings, new buildings, parks and graffitied walls – it was all stunning. And even better with the backdrop of mountains, snow capped and clear, although a little hazier as the day went on. - Dogs rule the city. Most Chileans, excluding the government, believe the city belongs to the dogs and the people just get to live there, too. And there are dogs everywhere. We saw some wearing clothes, so we figured they weren’t all strays, but apparently they are. Locals will dress the dogs, especially now in winter, with spare jumpers and jackets that they no longer wear. During the World Cup last year, Santiago’s dogs were dressed in Chilean jerseys and hats – how I would have loved to see that! And the dogs are all friendly. They will follow big groups, or sit with you in the park. They won’t pester you for food – because the locals will feed them. And dress them, and even vaccinate them. These dogs are well looked after! The tour finished at 2pm so we made our way back to the hostel for a rest. On the way back, we picked up a traditional Chilean hot dog, and a beanie. Random combination, right? Let me explain. Santiago has a high population of students, in particular in the Bella Vista area where our tour finished. Here you have heaps of hot dog stands, serving mostly the same thing. Not just sauce, onions and cheese – these bad boys are topped with diced tomato, thick guacamole and tahini, plus whichever sauces you wish to add. There isn’t room for much more though – the bun is already overflowing with toppings. Honestly, there was at least a whole avocado on my hot dog, which alone would cost $3 in Australia (or 2 for $5!). But these delicious snacks are only 800 Pesos – about $1.60. Delicious – next time I’m trying the ‘As’ which replaces the sausage with beef steak – om nom. Secondly (that’s right, there was a second point!) I found myself an alpaca beanie. My ears had been freezing all day, but now they are toasty warm. Hot dog and warm ears make Emily Benjamin a happy girl! In the afternoon, still wanting to make the most of our time in the city, we took the funicular up Saint Theresa for a view of the city and mountains. It was stunning – see attached. We left just before sunset, as the mountains started to glow pink and gold from the sun. I was so happy to see the mountains, after reading numerous posts about the haze and pollution in Santiago. But luck was on our side, with 360 degree views of the Andes surrounding Santiago. Absolutely gorgeous. Now we’re heading to Easter Island for Monkey’s birthday present. What does one get the man that has no home? A weekend away in the middle of the Pacific Ocean, that’s what! We’ve got two days here to enjoy hiking and volcanos and seafood before heading back to Santiago to visit the rest of the city. Phew, this whole post was just from one day?! I must be inspired! I never thought we’d get there. Easter Island, about 4000 km from the coast of Chile, and more than that from the next bit of land in the Pacific Ocean. The only airport I’ve been to that sees only one flight a day – so no excuses for flight delays, woohoo! But Easter Island was on ‘The List’ and it was my special treat to my special Monkey for his 30th birthday. That’s right, world – Jamie Talbot is 30! So we set off from freezing Santiago on Saturday morning, and arrived on Rapa Nui by midday. Our lovely host Marcelo would be our go-to guy for the next 48 hours – he owns the Kaimana Inn and Restaurant, where we slept on the comfiest bed I can remember and ate a delicious lunch and dinner. Once we were fed and ready, it was off to explore the first corner of the island, with Marcelo at the wheel. We first had a tour of the only town on the island, Hanga Roa. He tells us 95% of the island community live here, which is a few thousand people. A few more are scattered over the island as farmers. But on a clear day, you can see from end to end. The island is in a triangle, totalling about 160 square kilometres, with a volcano on each corner – the highest being just over 500 metres. Our first stop was Rana Kao, on the southern end of the island. A giant crater, now filled with water and reeds, right on the edge of the coastline. From there we walked around the crater to the other side, and checked out the islands where tribes used to host the bird man competition each year. They would camp out on the hill waiting for the call of the bird, then climb down a cliff, swim out the island, search for the birds egg, swim back, climb back up and be awarded the Island King for the next year. Oh, that’s if they survived the freezing waters, didn’t lose or break the egg on the way, or even found the egg in the first place. Not a very simple treasure hunt it seems! But it came with the privilege of naming the next king, and you’d have a pretty sweet life for a year if you’d got him there. 6:15pm – Wow isn’t it amazing! Look at the colours! 6:21pm – Ohhhhh! It’s so shiny! 6:23pm – Look now! It’s so much shinier! 6:32pm – WOW! That’s the best shot yet! 6:45pm – Shoot. Ran out of space on my memory card. Yeah, ok, I think we have enough sunset shots now. Good news is that we took enough photos to tide us over, with no need to go out the next night. Phew! That night we went to a traditional Polynesian show, with about 12 local dancers. It was energetic and entertaining, and as it’s only on a few times a week I’m glad we got to see it! But by the end it was 11:30pm and we’d been awake for 21 hours, and I was knackered. No rest for the wicked though – we were up at 6:30am for sunrise. It was cool again (not as cold as Santiago though!) but warmed up quickly – mostly because we began jumping over moai’s in the sunlight. I know it seems lame. But at least we’re not planking, right? Anyway, for the whole day we explored the rest of the island, including some of the more famous Moai on the north east of the coast. Here we saw a few hundred Moai all in one spot, including some unfinished ones. The site, at the base of a volcano, is known as the Moai birthplace, where local tribesman would carve the moai from volcanic stone. Eight to twelve months later, when finished, they would slide it down the mountain carefully, ready to be transported to it’s chosen location. No one knows how, though – maybe over palm trees, maybe by water. But there were many than never made it, now left here at the base of the volcano. Rio was big on my list. 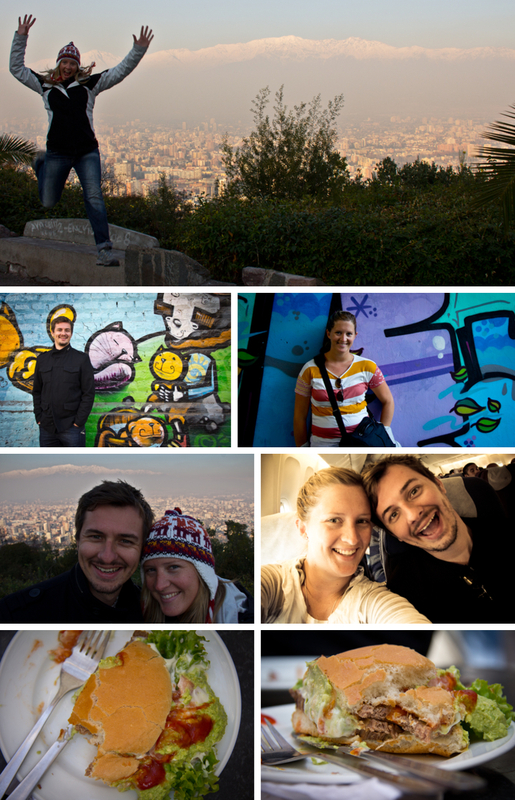 I was so excited to see the harbour, Sugar Loaf, Christ the Redeemer, and see if I could capture some of the colourful city in the nine days we were there. But as soon as we arrived at our B&B in Ipanema, our host spotted my camera bag and suggested I leave it at home. What? Leave my camera here? What would be the point of that?? Not getting it stolen apparently – even in broad daylight, on a weekday, at the Botanic Gardens. I’d read Rio was bad, but I was surprised. We later realised that Ipanema was tame compared to where we stayed next, in Lapa. We met a couple that had been mugged just two days earlier and had their money, camera and even their Lonely Planet stolen. In daylight, in Lapa. So we now had to be even more cautious. But if you go straight to the tourist spots, by cab, you’re apparently safer. It’s walking around that will get you. On the third day, the weather had cleared and we were off to see Christo Redentor atop Corcovado… along with ever other tourist and caroica in Rio. We didn’t realise our visit coincided with Corpus Christi, and were met with huge delays and lines to get to the top. Eventually we made it JUST in time for sunset, and slowly wedged ourselves between hundreds of others to get views before the light faded. All the while squeezing my camera bag around me, of course. The view itself was pretty amazing. I do wish we’d been in one of the helicopters buzzing around, because there were certainly way too many people visiting that day. I now consider myself an expert of people management at touristic sights, because I’ve seen a few. Angkor Wat, Alhambra, Stonehenge and Petra are all very well managed – restrictions on numbers or even having enough space to cope for people is a big part of it. Some of the sights in Barcelona, and certainly Corcovado here in Brazil, however, require a bit of re-thinking. But that won’t happen, because the private drivers that charge a little more than average to whisk you up the mountain will lose their business, and I don’t think any Brazilian will take that lying down. Unless they’re already lying down atop Corcovado to take a photo, like the 20+ people we saw doing it that afternoon, being trod on by everyone else. The other big sight we were looking forward to was Sugar Loaf Mountain. Or as a young French girl might say, Sweet Bread Mountain – her translation from Pane Sucre. Sugar Loaf did not disappoint – a prime position in the bay, it has 360degree views of Rio de Janeiro but without the hoards of tourists at Corcovado. And the view is just as spectacular, if not more so. Sticking with my theory that certain sights are better from below or afar (the list includes Eiffel Tower, waterfalls and lighthouses to date) the view of Christ the Redeemer from Sugar loaf is potentially better than vice versa. Sugar Loaf isn’t as high, but the view is still great. And maybe the most important advantage of Sugar Loaf over Corcovado? Monkeys! We explored Lapa a bit more in the next few days, but also caught up on some reading and resting. Oh, and eating of meat. I have loved the return to red meat here in Brazil, after the cold cured meats of Spain. Here you can get every meat, on huge skewers, just lightly rubbed in salt and then BBQ’ed. Absolutely delicious, and even better once we found a restaurant that prices meals by the weight. One night we paid R$120 for dinner, the next we had the same meal but for R$25. Bargain! Overall, Rio wasn’t the party paradise I expected it to be. But feeling unsafe is certainly not an aphrodisiac for a country. Being the photo-nut that I am, I was too scared to head out with my camera, for fear of losing it. It’s insured, and we’re covered for theft and mugging, but it would be a huge inconvenience to have my camera taken, right before Machu Picchu. A day at the police station to lodge the paperwork, days to sort it with insurers back in Australia, and no real certainty over getting a replacement – not much fun. So I went the cautious route, and as such I have the same tourist-y photos as most people. Maybe next time in Rio, I’ll learn enough Portuguese to tell potential muggers where to stick it if they try to get me. Just like the ingredients in my potato bake, I am sure making of the ultimate steak sandwich is a contentious issue. Some of you might favour the gourmet steak sandwich, served with caramelised onions on a toasted ciabatta. Others might dig the Coffee Club special, served on thick toast with red lettuce. But for me, it’s a simple, soft and tender delight, with very little effort required. Firstly, ditch the toast. I mean it – toasted bread for a steak sandwich, or any sandwich for that matter, and you’re doing it wrong. Toast is uncomfortable to hold, has poor absorption qualities for the condiments, and breaks into pieces when you bite into it. Instead choose soft thick bread slices, or if you’ll allow in this instance, a soft bread roll. Doesn’t matter the size, although we’ll come back to that when we get to the steak itself. Bread should be 70% soft at an absolute minimum. Any toasting, if required, should only be done to the inside of the bread. Soft on top with maybe a little toasting inside. Got that? Good. Let’s get some fillers. Obviously, you need a steak! And this is probably the point that stops me from ordering steak sandwiches more often. You never really know what you’re going to get. Will it be a thick cut, still-bloody steak, that consumes all the other flavours of the burger? Or will it be a cheap, well-done, stringy, fatty mess that tears apart the whole sandwich as you try to bite through the grizzle. Neither! The steak should be thin, but not over cooked. It should still have a little pink in it, so if it’s a thin slice be careful not to cook it too long. It should be tender and stringy-fat free – the worst thing you want is to take a bite and have the whole steak slide out of the sandwich and drop onto your plate, because you couldn’t bite through the grizzle. Then you get all messy putting it back together – tsk tsk. So it’s simple – a thin, tender, medium size steak, preferably in a similar shape and size to your bread of choice. Maybe buy the steak first and find bread to match! Whatever you do, you want to avoid having a steak that is too small for the bread. Just think of how disappointed you’ll be when you get to the last bite of your awesome sandwich, only to discover the steak finished and only salad between the bread. What a let down. Steak, then cheese, then tomato, then lettuce. Not the other way around, or in a different order. I’ll explain the reasons. Firstly, the cheese should be next to the meat. The warm steak will melt the cheese – heaven. But you don’t want the cheese flavour being next to a condiment so they stick to opposite sides of the steak. Then tomato, next to cheese and lettuce, but away from the bread. We’ve all opened our lunch boxes at school at some stage, to find soggy, wet bread because the tomato had juiced all over it. Thanks, Mum. Gross. Keep the tomato in the middle, and you’ll be ok. Lettuce is next to last because, well, it should be. Got it? Good. Now condiments. Tomato sauce, mayonnaise, mustard and BBQ sauce are the options. If you’re thinking the word ‘chutney’ right now you can forget it – I said nothing fancy. I personally don’t like BBQ sauce, but I know some people that can’t live without it, so I won’t weigh in on that one. Tomato sauce and mayonnaise work well together, as do mustard and tomato sauce. You probably shouldn’t use all three because you’ll over saturate your soft bread and have a soggy sandwich. Not cool. Consider your ingredients as well – mustard tastes great, but not if you’ve put avocado on the sandwich. But avo and mayo go well, so maybe thats an option. Just pick two, and spread one to each piece of bread. Easy. Finally, side dishes. Depending on the size of your sandwich, you may not need any. But if you do, hot chips can’t really be beaten. Maybe wedges, but you won’t eat very many and no one ever serves enough sour cream and sweet chilli sauce to go with them. Also, wedges are very filling, which might leave you with stomach aches after your epic steak sandwich as well. So either no side, or some chips. With sauce, of course. There you have it – the recipe for a perfect steak sandwich. Inspired by a delicious steak sandwich I just had here in Rio de Janeiro, made almost exactly as I would make my own. Melted cheese, tender steak and soft bread that was mopping up all the juicy awesomeness. Mm mm, a proper steak sandwich can’t be beat!